Baked egg have returned to “in vogue” status as of late. 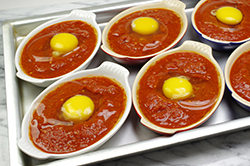 Spicy baked eggs, in particular, have a reputation for curing any night-before excesses. The term, “fra diavolo” translates as “brother devil” – perhaps an apt reference to the one that may have led you into trouble the evening before. The best part about this dish is that the sauce may be made ahead of time, then with the simple addition of the eggs, the dish is in the oven baking. 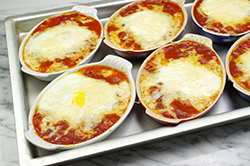 These baked eggs can be made in individual bakers or in a larger single baking dish. The egg’s white portion solidifies, while the egg yolk part remains a bit runny – the perfect opportunity for dipping bread! Serve with a little extra hot sauce on the side. (1) Prepare the spicy tomato sauce: In a 3-quart saucepan, add the olive oil and sauté the crushed garlic for 30-60 seconds until the aromas have bloomed, but before the garlic browns. Add the white wine and cook until reduced and nearly evaporated. 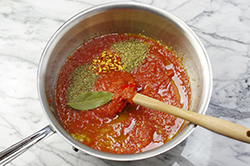 (2) Add the crushed tomatoes, salt, oregano, basil, bay leaf, and red pepper flakes. Simmer over low heat for 10 minutes to allow the flavors to mix and mingle, and to thicken slightly. 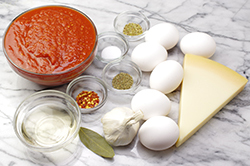 The diavolo sauce may be cooled and stored, refrigerated, for up to 5 days. Makes about 3 cups of sauce. (3) Preheat the oven to 425°F. 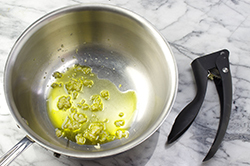 Prepare individual shallow baking dishes, or a single 3-quart baker by rubbing the interior with a thin film of olive oil. 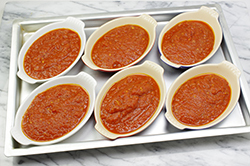 Warm the diavolo sauce, if not already warm, placing a generous layer of sauce in each baker, about a half-inch deep. 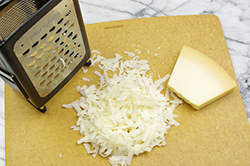 Crack an egg in the middle of each baker, top with a sprinkling of the Parmigiano-Reggiano cheese. (4) Bake in the hot oven for 10 minutes or until the egg whites are firm and the yolk cooked to the desired consistency. 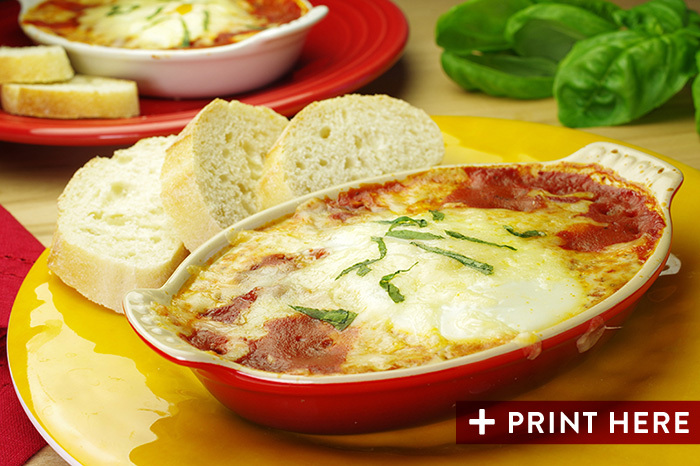 Serve immediately with plenty of bread to mop up the sauce.